Shopping Cart Icon Style – you can choose from different icons for mini cart in header. Mini Cart Max Products – set maximum amount of recently added to cart products in header mini cart drop down /slideout. Show mini cart when product added to cart – you can show mini cart drop down when product is added to cart with ajax. You can enable carousel slider for related and up-sell products set columns and maximum amount of related/up-sell products per page in WooCommerce – WooCommerce General Options section of 5th Avenue options panel. Additionally you can show/hide cross-sell products block on cart page. Keep your customer engaged promote products categories or simply add come additional information on empty cart page. 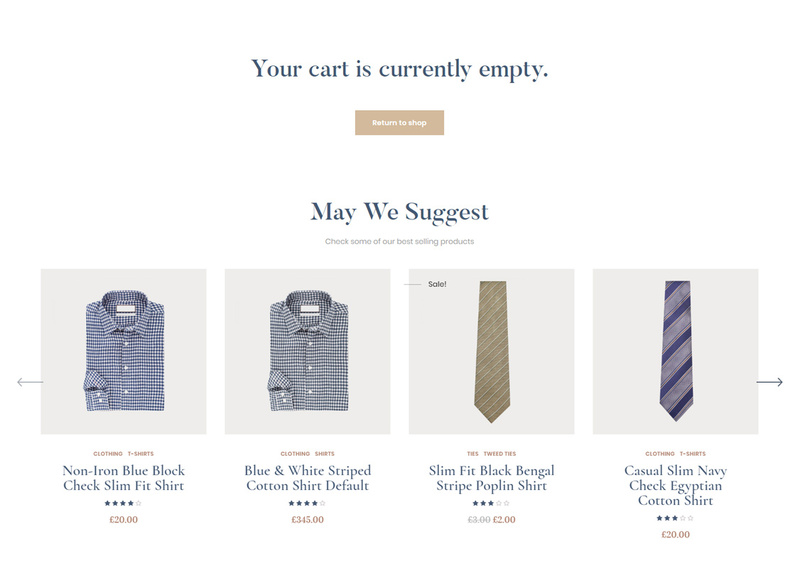 To do this enable Show additional content on empty cart page option in WooCommerce – WooCommerce General Options section of 5th Avenue options panel and then paste your page content into Empty cart page content textarea. This content will be displayed on empty cart page after the main content. See image below. Ajax add to cart for catalog is a part of default WooCommerce functionality and can be enabled in WooCommerce – Products – General section of WordPress admin panel. Simply check Enable AJAX add to cart buttons on archives checkbox. Ajax add to cart for product page is a Fifth Avenue theme feature and can be enabled in WooCommerce – Product Page Options section of 5th Avenue options panel. Switch Ajax Add to cart on product page to enabled. 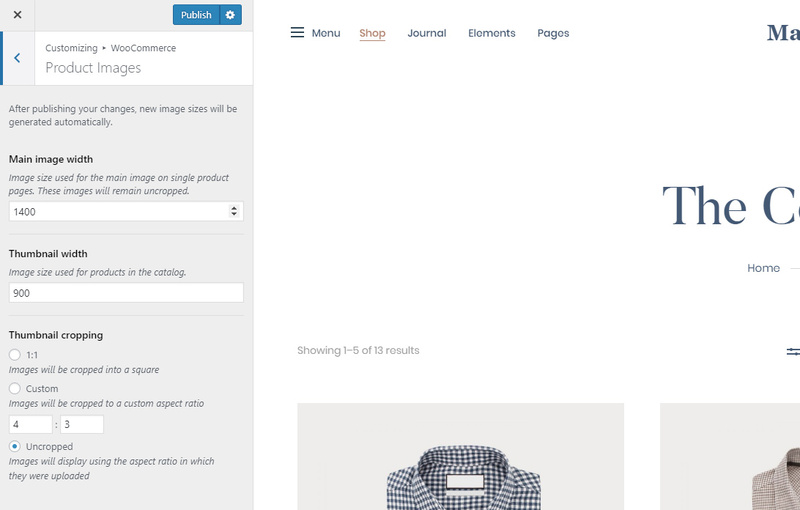 You can also show mini cart after you added product to cart with ajax. To do this you need to enable Show mini cart when product added to cart option in WooCommerce – WooCommerce General Options section of 5th Avenue options panel. Product image sizes can be adjusted in Appearance – Customize – WooCommerce – Product Images. Main image used on product page and thumbnail is for catalog. Keep in mind that this is a size of an image itself it doesn’t affect the column size. If image is bigger than the column it will be scaled down.